Zaghw and Al Shaer shake hands after signing the agreement. 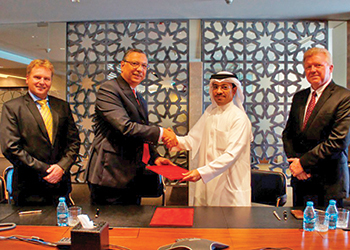 The contract includes the comprehensive primary designing of every aspect of infrastructure within the urban development, said Dr Maher Al Shaer, the CEO of Diyar Al Muharraq, after signing the agreement with Hamed Zaghw, the regional chief operating officer of Aecom. As per the deal, Aecom will be responsible for providing primary design and construction supervision for all the infrastructural components of Diyar Al Muharraq.